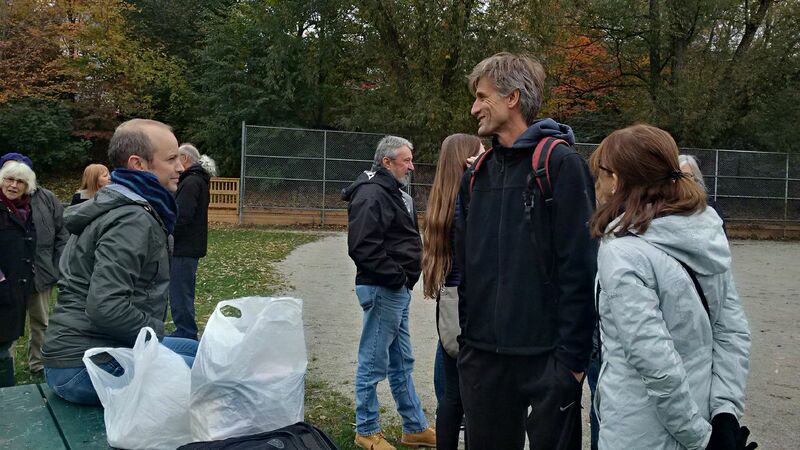 Bickford Park plan: final round? 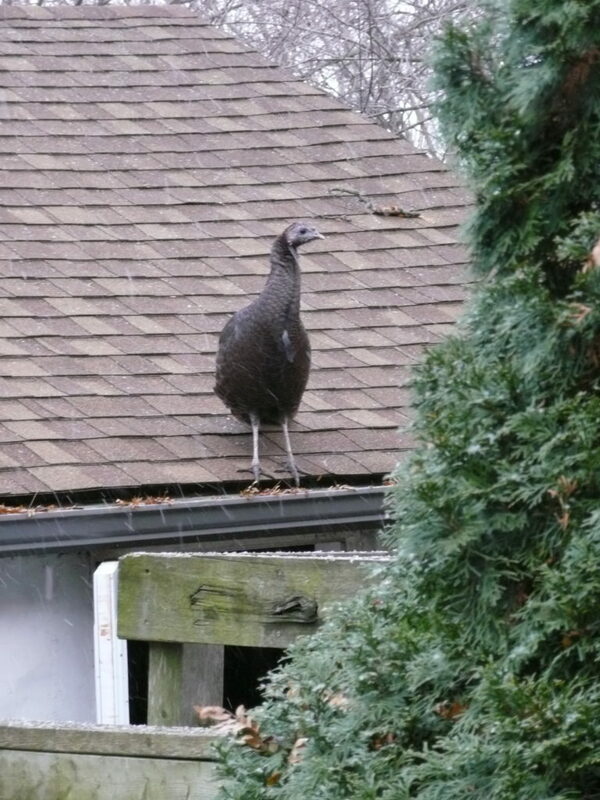 A wild turkey has lived in the Bickford Park area since the summer of 2018. It survived the severe winter of early 2019 Last sighting March 1, 2019, in Harbord Park. 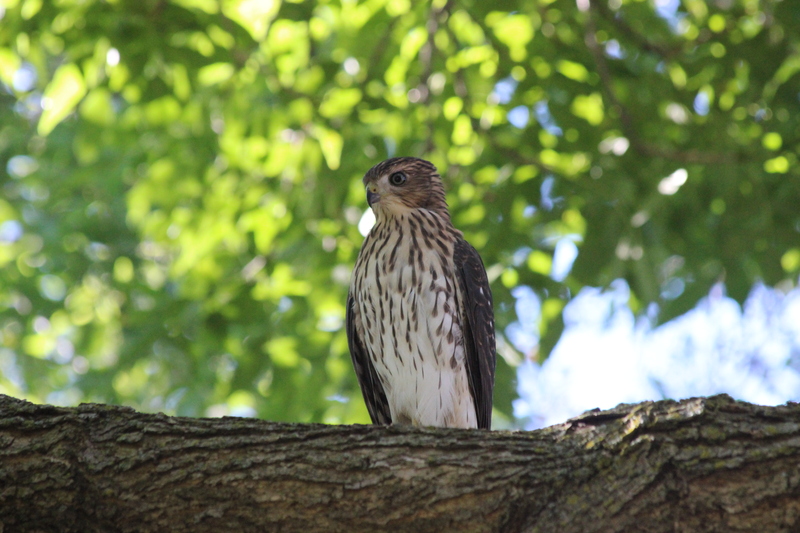 Very early this spring a pair of Coopers Hawks nested on the west side of Bickford Park. They produced 3 young birds and raised them through some major storms, the noise of Victoria and Canada Day firecrackers, and all the sounds coming from the park. In mid-July the young left the nest although they stayed around the park to learn to hunt with their parents. As with other hawks, females are larger than males. The picture is probably of a young male. Chicks are initially covered with white down and later white feathers, some of which can still be seen on this male’s shoulders. The photo was taken by Nola Grimes. There is more good nature news: bats are back in Bickford Park. After being devastated by a fungal disease all across North America, a few have returned to our park, raising hopes for their recovery. It’s worth remembering that they can eat as much as their body weight or more of mosquitoes every night. After many years of debate and planning the redesign of Bickford Park is complete. Key improvements consist of the creation of a fenced-in dog area at the south end of the park and the planting of shrubs along the southern section of the fence. As well, there is now a new paved path across Bickford which allows pedestrians to walk through rather than around the park. New trees and benches create a larger natural recreational area at the north end. The former north diamond was relocated across Harbord Street to Eggleton Park. On Sunday, October 29th, the Friends of Bickford Park celebrated the inauguration of park improvements made in 2017 with a ceremonial piping-in and walk on the new park path. 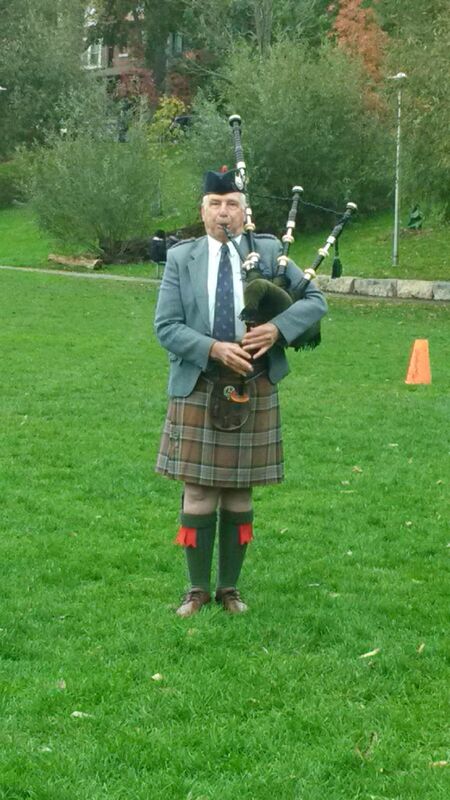 Refreshments were provided by our friends at the Beans and Baker Malt Shop and Councillor Mike Layton also participated. 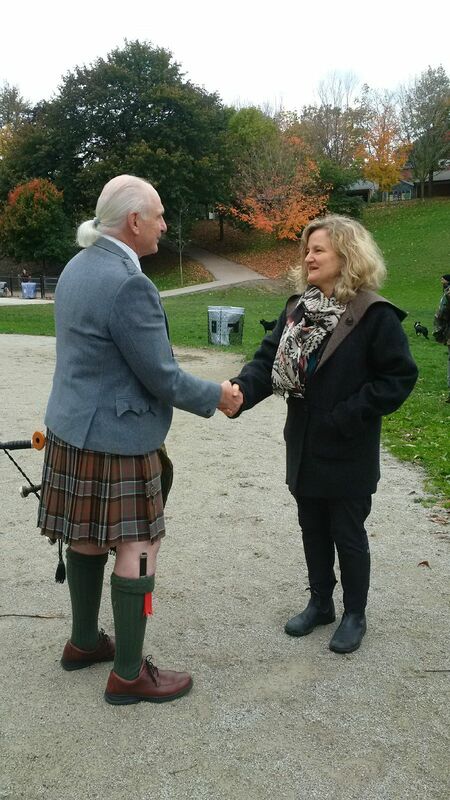 Local residents chat with Councillor Mike Layton while refreshments are being set up. Our piper leads us on for an appreciation tour of all of the park improvements made in 2016 and 2017. 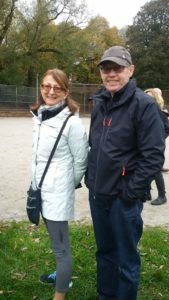 Local park enthusiast Bernd Baldus explains the positive impacts of the park renovations. The final plan for Bickford Park shows three major changes in the previous park layout. The north diamond children’s baseball has been moved to Eggleton Park. A dog closure was constructed at the south end of the park. The third project, a new path along the east side of the park, is scheduled to be built in June 2017 and should be completed in August 2017. In 2013 copper cladding was stolen on two occasions from the Memory Banks art installation around Montrose school. This project was created as part of the Garrison Creek Linkage Project to suggest the banks of the Garrison Creek which once ran through Christie, Bickford and Eggleton parks. The perpetrators, posing as Parks employees and claiming to remove the cladding for ‘security reasons’ were caught by the police during their second attempt. In Fall of 2014, the bronze plaques with native fern designs inserted in the concrete path along the west side of Christie Pits also disappeared. The Parks Department has now filled the empty squares with asphalt. The financial damage is major. This was the only public art in our neighborhood. There is no indication whether or when these projects will be restored. 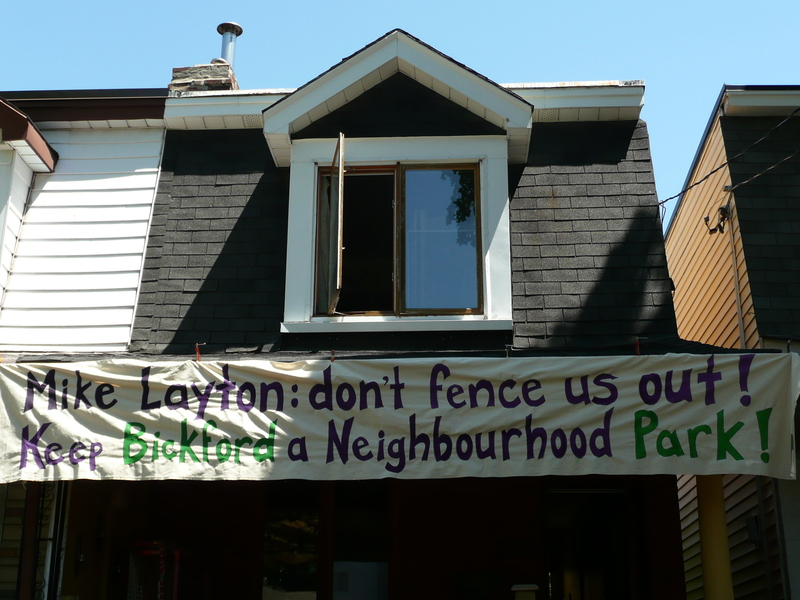 The following petition was handed to Councilor Mike Layton on June 2, 2014. It was signed by almost 250 people, most of them residents of Montrose, Grace and surrounding streets. Support for the petition among those canvassed was nearly unanimous. Plans are being made for redesigning Bickford Park. Despite being assured that residents and recreational park users would be given special consideration, there is now a possibility that designs will be finalized without further consultation. 1. Neighbours and recreational park users must be consulted before developing any final plan. 2. A single diamond in Bickford Park, improved and designated for children’s baseball. 3. An ample-sized, fenced-in dog area. 4. A green oasis with trees, grass and benches, free space for informal field activities and a walking link through the park. Bickford Park must remain accessible for families, seniors, joggers, or outdoor education programs which raise children’s awareness of natural environments. 5. A path that leads people through rather than around the park. We live here! We have a right to be heard! Sign our petition to ask Councillor Mike Layton to meet with us BEFORE plans for Bickford Park are finalized! 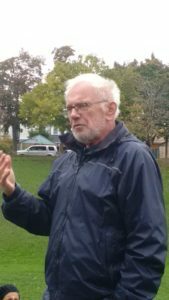 In a flyer distributed in the neighbourhood in July 2014, Councilor Layton announced that the north diamond in Bickford Park will be removed, and that two new diamonds for children’s baseball will be constructed in Eggleton Park. The new diamonds are already completed, while the north diamond in Bickford is to be removed in late August or September of 2014. 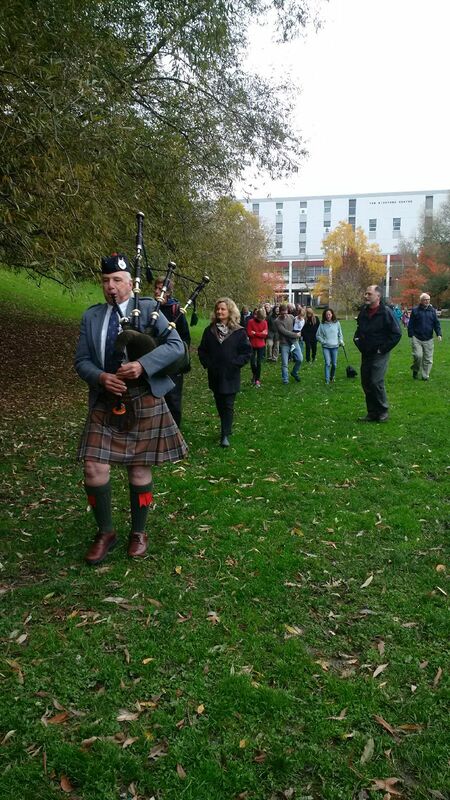 This is a significant advance, and is to a large extent due to the petition signed by many residents and park users. 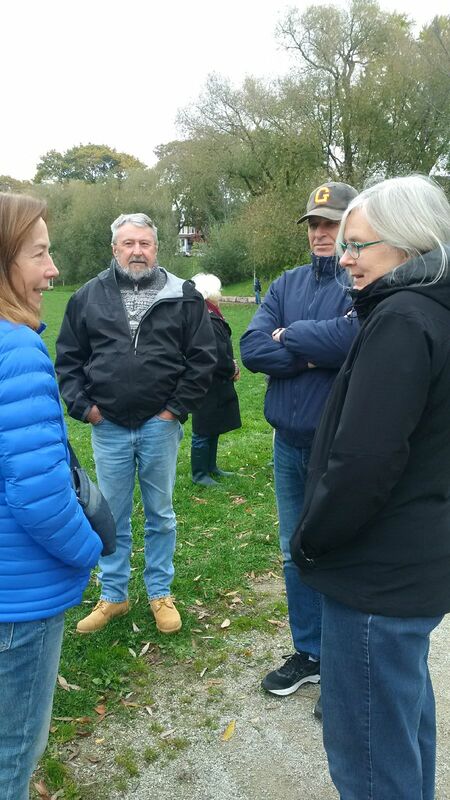 Now that this longstanding point of contention has been resolved, we will make sure that all users of the park have a say in the future design of Bickford park. In Eggleton Park, the problems of the Bickford diamonds, namely their use by adults, must not simply be transferred to the new location and interfere with pedestrian and recreational use of the broad path on the west side. In Bickford, there are many issues concerning the future design of the park, among them the location of a path, the size of the dog off-leash enclosure, and the areas for play and green space. Check this space for future updates! 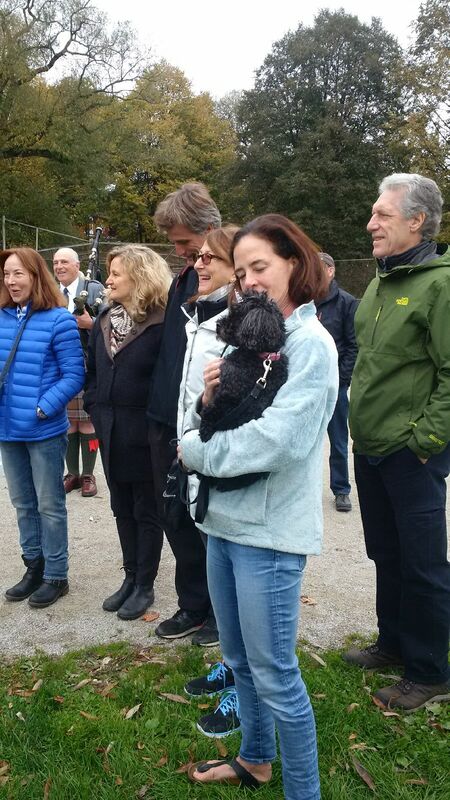 Will a single diamond in Bickford Park “displace a couple hundred baseball kids”, “eliminate the Tee Ball diamond and replace it with a giant unfenced off-leash area for dogs” and “threaten sports in Bickford Park”? The answer is clearly: no! Children’s baseball in Bickford was founded by local residents and has long been supported by them, and many local children have participated in these programs. It is, and will continue to be, a delightful and welcome part of Bickford Park. 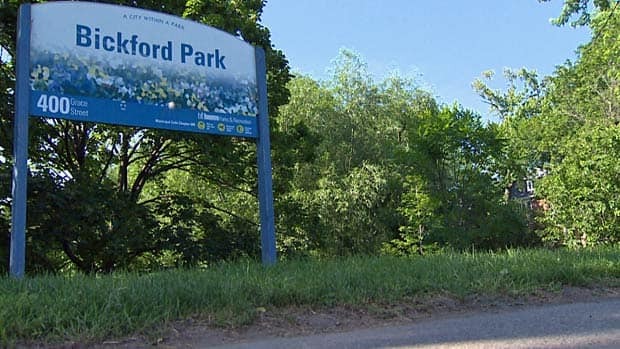 However, like other parks in Ward 19 which the City considers “parks deficient”, Bickford Park has come under increasing strain from unbalanced uses and territorial claims. 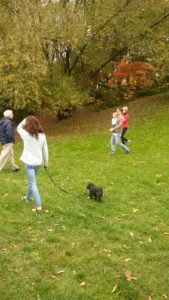 The small park cannot sustain two diamonds, soccer games, an off-leash dog area, and still serve as a neighborhood park. Pedestrian and bicycle traffic has increased along the west path. Dogs often stray into the park. Although both diamonds are classified as undersize, they are increasingly used for adult baseball games during key hours of summer evenings and occupy the entire park floor and the south-west slope. Other users have to walk around rather than through the park. The planning process initiated by Councilor Layton tries to create a greater balance of uses. The removal of one diamond in plan A maintains children and youth baseball programs, offers more space for informal recreational activities, and creates a sufficiently large and effective enclosure for unleashed dogs. Most important, it also adds to the tree canopy, allows some landscaping along the path, and preserves parts of Bickford as a quiet, green environment. 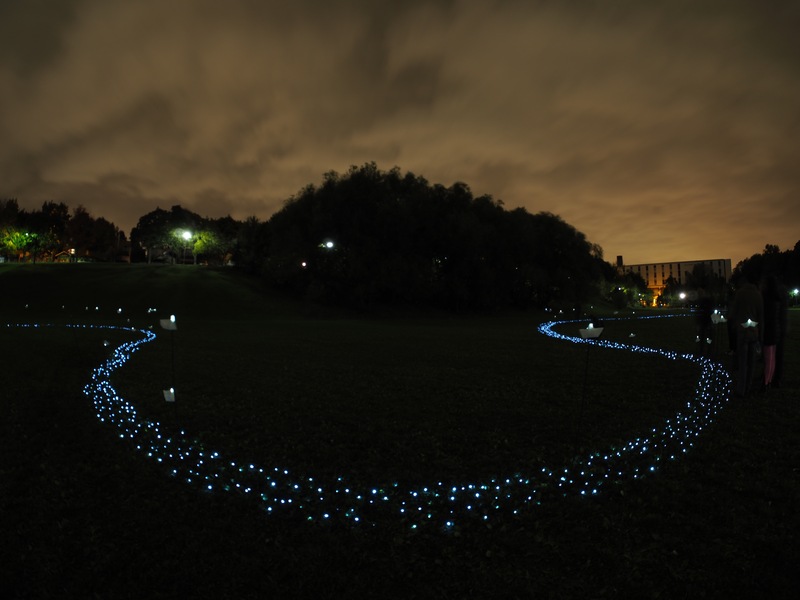 Currently, 6 diamonds exist in the adjacent Christie Pits, Bickford and Eggleton parks, more than twice the number in other downtown parks, many of which are much larger. Children and youth baseball programs use the two Bickford diamonds only for a few hours each week, and at these times the Christie Pits fields are often empty. There is no question that these games can be consolidated on the remaining diamonds. High Park operates a larger children’s program from only three diamonds and uses fields in neighboring schoolyards and parks. 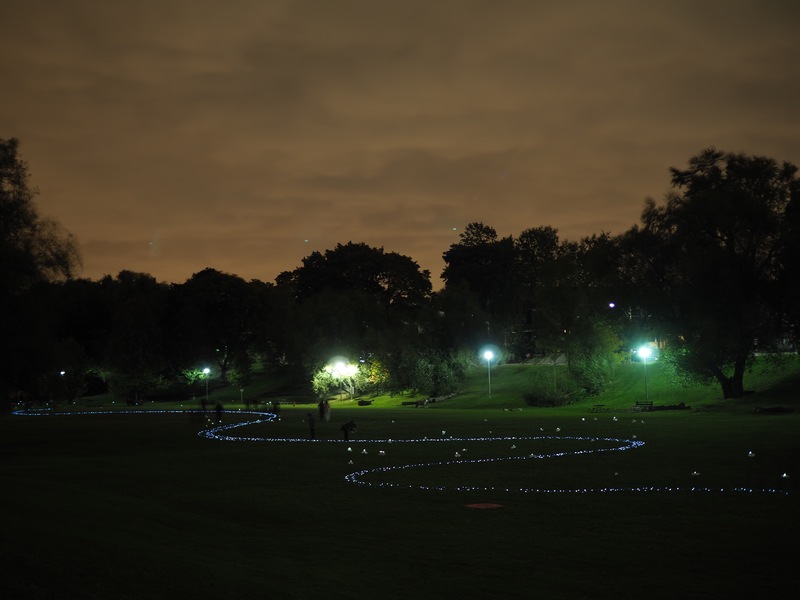 For adults, full-size diamonds are available in Christie Pits, Dovercourt, Trinity Bellwoods and Stanley parks, and in numerous other locations. In addition, some 25 smaller diamonds exist in our neighbourhood. If in the future more space is needed for t-ball, a refurbished diamond in Eggleton park, located on City land close to a wading pool and playground would be perfect, especially for parents who bring younger siblings. Our area is clearly parks-deficient, but does not suffer from a shortage of baseball fields. The Toronto Playgrounds organization has told you to “vote for plans B and C”. Please take an unbiased look at the three plans on the News section of this website. Help us create a green and attractive environment for all users of Bickford Park, including your children! 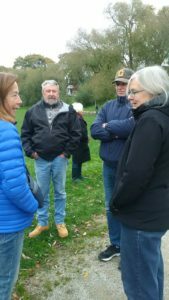 Galina Bershteyn on Bickford Park plan: final round? 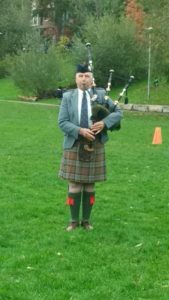 Bob Goyeche on Bickford Park plan: final round? Paul Orenstein on Bickford Park plan: final round? Bernd Baldus on Bickford Park plan: final round?